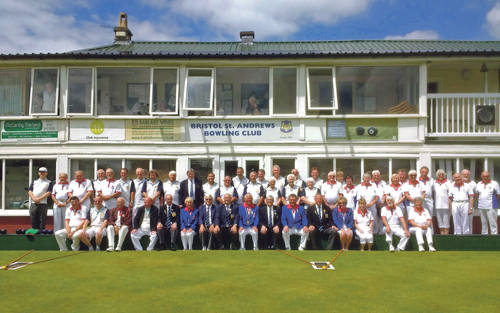 The official reopening of St Andrews Bowling Club following its extensive refurbishment was marked with a celebration match between the club and guest team, Bowls England. Despite extreme weather warnings for the region, the sun was shining on a very hot day at the start of June. Bowls England were represented by 24 bowlers from 15 countries throughout the UK, some of whom had travelled from as far as Lancashire. Also there were former members and invited guests from companies that had supported the club and helped to make the refurbishment and members works possible. A generous grant of £50,000 towards the refurbishment works came from the Enovert Community Trust, funded through the Landfill Tax. Angela Haymens, Trust Secretary of the Enovert Community Trust, represented the landfill company at the event, whose grant went towards improvements to the old windows and doors, repairs to the leaking roof, as well as fitting a new balcony and flooring. The improvements have made the whole building a better meeting space for the community as well as the Bowling Club and is much appreciated by locals like Myrtle Heal, who has been coming here since 1993. “The younger ones of the team have worked hard to make it all look good. And they’ve done the kitchen too which is lovely,” she said. “I have no complaints whatsoever,” added Brenda. Bowls England were the winners of a very competitive match which was followed by a hot meal and drinks in the clubhouse and speeches by John Pearch (BSA chairman) and Bill Smith (President of Bowls England).